Although born in Boston, Pearce spent most of his adult life in France. This subdued scene, set in a village of northern France, provides an unflinching and unsentimental glimpse of peasant life, a recurring theme in Pearce’s work. The artist has meticulously rendered the foreground figures as individual, character-revealing portraits. 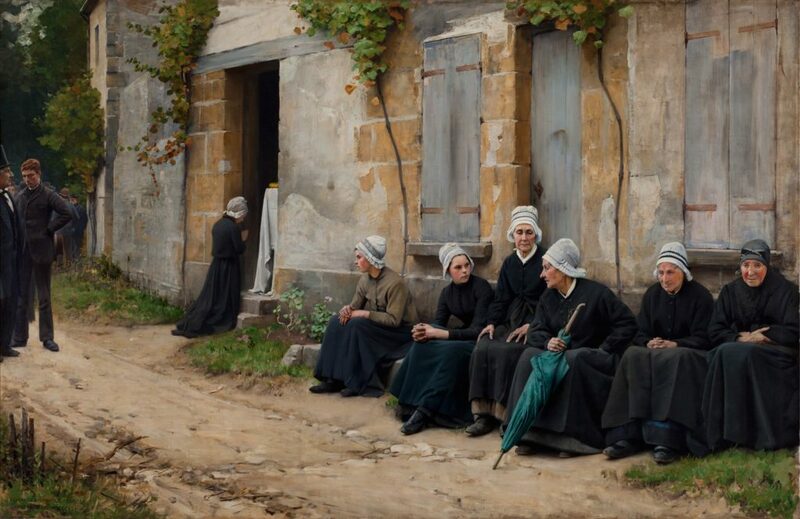 The women, clothed in black dresses and white bonnets, span a range of ages but are united by detailed hands that bear the telltale signs of hard labor. The thin light of an overcast day mutes the colors, eliminates shadow, and sets a mood befitting a funeral. There is little interaction among the women, who sit in silence. The dirt path directs the viewer’s attention to a young girl who kneels at the casket. Pearce’s work is indicative of the academic training American artists received abroad in the late nineteenth-century, and the style that was embraced by members of the Boston School.